PIZZA DOUGH! You have seen the chefs on TV twisting and swirling their pizza dough in the air. Do you think it is impossible to make a good pizza dough at home and a good pizza in your oven? I will change your mind. 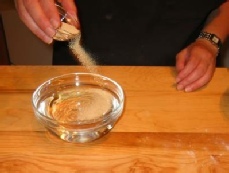 In a small bowl, sprinkle the yeast on the warm water and stir to dissolve it. Set aside until the yeast starts forming bubbles in about 5 minutes. Sift the flour. 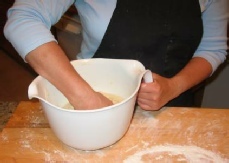 Pour the flour into a large bowl or on a work surface. 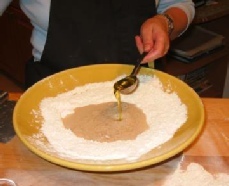 Mold the flour in a mound shape with a hole in the center. Pour the yeast mix in the center . . .
. . . . then the olive oil and a pinch of salt. Using a spatula, draw the ingredients together. 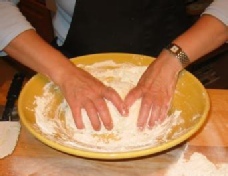 Then mix with your hands to form a dough. Sprinkle some flour on the work surface. 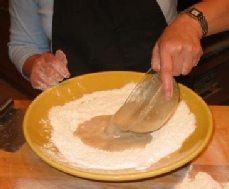 Place the pizza dough on the floured surface. 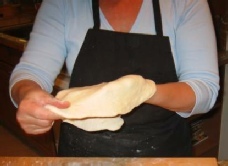 Knead the pizza dough briefly with your hands pushing and folding. 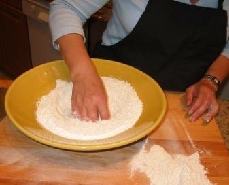 Knead just long enough for the dough to take in a little more flour, and until it no longer sticks to your hands. With your hand, spread a little olive oil inside a bowl. 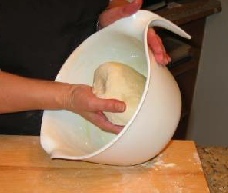 Transfer the dough into the bowl. 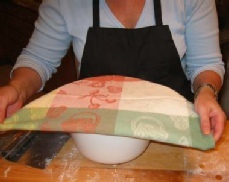 Cover the bowl with a kitchen cloth, and set the bowl aside for approximately 1½ – 2 hours until the dough doubles in volume. The time required for rising will depend on the strength of the yeast and the temperature of the room. 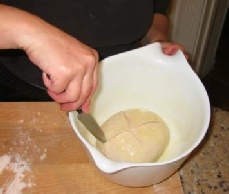 When the dough is about double its original size, punch it down to eliminate the air bubbles. 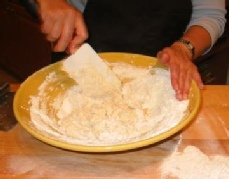 On a lightly floured work surface, cut the dough into three equal pieces. 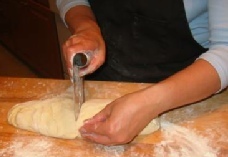 On the work surface, using a rolling pin . . . .
. . . . and your hands, shape one piece of dough into a thin round layer. Make a pizza about 12 inches in diameter. Make a pizza about 12 inches in diameter and transfer it to the pan. Using your fingertips, push from the center to the sides to cover the entire surface of the pan with a thin layer of pasta. Repeat this step with the other 2 dough pieces to make 3 pizzas. On the top of the pizza dough, make two incisions that cross, and spread with a very small amount of olive oil. 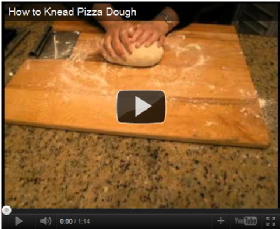 This last step will prevent the surface of the dough from breaking too much while rising. The smoke of the wood also gives pizza dough a distinctive flavor. It is impossible to reproduce perfectly the same conditions at home, but with my step-by-step recipe, you will be able to make an excellent pizza dough at home. 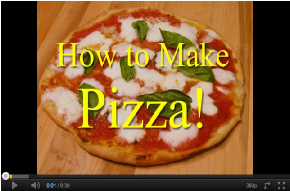 Making pizza dough is very inexpensive and very simple if you follow my step-by-step instructions. Pizza is cooked at the restaurants in wood-burning ovens at a very high temperature for about 10 minutes. In fact, pizza should stay in the oven for the shortest time possible to prevent it from drying too much. 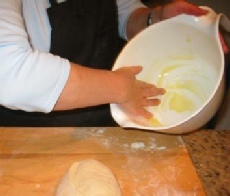 Many people is intimidated by touching pizza dough. Don’t be! 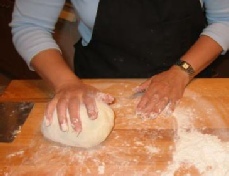 Actually kneading a dough is very simple and fun. I have a small movie here showing exactly how to do it. Practice and you will see how easy it is! At this point, the pizza is ready to receive its toppings (see recipes). Add onto the pizza your preferred toppings. Sprinkle with a pinch of salt and pepper if indicated by the recipe. * Cook the pizza in a regular oven at 500 F (260 C) for about 20–25 minutes. * The cheese for a homemade pizza, if present in the recipe, should be added 5 – 10 minutes before removing the pizza from the oven. * To check for readiness, lift one side of the pizza. The pizza is ready when the bottom surface is light brown. Yeast is a living microorganism that produces a gas called carbon dioxide, in presence of warm water and food (sugar or flour). In the “Active dry yeast” this bacteria is dormant. It wakes up as soon as you transfer it in warm water. This process is called “proofing the yeast.’ The active yeast will come back alive and you will see small bubble forming on the surface of the water. 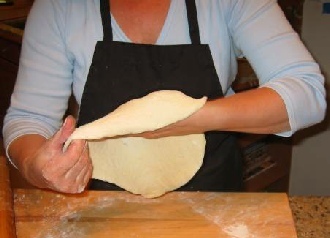 As soon as you mix the yeast with flour in your pizza dough, it will go to work and form all the bubbles that make the dough soft and airy. Warm water to proof the yeast need to be not too cold and not too hot. Just warm between 100F to 110F. Cold water would not revive the yeast. Hot water would kill the yeast and your dough wouldn’t rise. Flour. I normally use “King Arthur” unbleached flour but any normal unbleached flour would work. I only use extra-virgin olive oil in my kitchen because is the best and purest product without any addictive. Salt is just simple table salt. I normally use sea-salt as it is a more natural product. 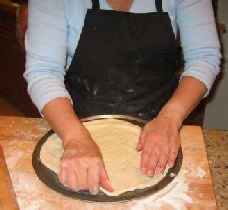 The temperature in the kitchen should be around 68–75 F (20–24 C) for the dough to properly rise. And in addition, at the end of the pizza dough preparation you will need PIZZA PANS. You don’t need anything fancy. Just the normal (possibly non-stick) pans you can buy very cheap in any grocery store.